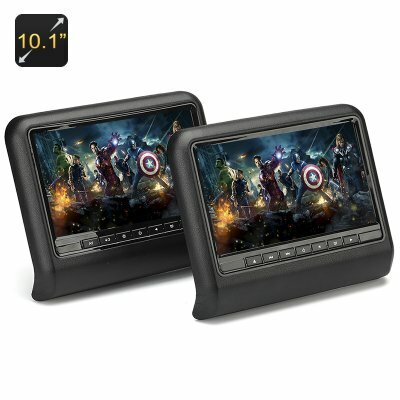 Successfully Added 10.1 Inch Car Headrest Monitors + DVD Player - Region Free, Game Controler, SD Card Slot, Head Phone Jack to your Shopping Cart. Tired of the constant fighting and arguments coming from frustrated children in the back seat? Well this fantastic in car entertainment system will keep them engaged and bring you relief on any journey be it the school run or a long road trip. With four different pairs of head rest adapters and adjustable mount this pair 10.1 inch universal headrest monitors and DVD player bring high resolution images to your back seat. The old adage that two is better than one is true with this head rest DVD kit as you get two 10.1 inch screens that can offer great viewing for back seat entertainment and allowing everyone in the rear to clearly watch movies. As this DVD player is region free there are no restrictions on which DVDs you play so you can buy movies and DVD’s from around the world knowing they will all be supported. There is also a wide range of supported file formats and when combined with USB and an SD card inputs you can copy and play movies and films from full range of sources. With a 16:9 aspect ratio movies will show in the wide screen format so you won’t suffer from cropped or squashed images and the 800x480 resolutions ensure a clean crisp image. With built in speakers, you can blast out music to your heart’s content or listen in peace a quiet using the 3.5mm audio jack, there is even a games controller for some interactive fun that will keep young and old entertained. So before you hit the road this holiday be sure to upgrade your car with this universal headrest DVD kit and take the stress out of journeys by keeping everyone entertained along the way. A nice and cool feature of the DVD player set is a game pad, which you can use to diversify the fun and play 32 bit games on. Thanks to the universal design, the DVD players will fit practically any vehicle, so you won’t have to worry about compatibility issues. The 10.1 inch Headrest DVD Player Set comes with 12 months warranty. Brought to you by the leader in electronic devices as well as wholesale headrest DVD players, Chinavasion.. This model is compatible with most brands of GPS software - however hardware specific software such as Garmin may not run on this unit. As the wholesaler, Chinavasion provides the GPS-enabled hardware only, not the software. Chinavasion provides no warranty or customer support regarding GPS software. Chinavasion cannot provide downloads, links, advice regarding GPS software. Any software installation you undertake should be performed or supervised by a professional.